Incoming Baby! (part 4) – BIRTH! February 14, 2014 12:30pm (34.5 hours of labour): I had just returned from a quick lunch break in the hospital’s food court to find the door closed on the room where my wife had been staying. I rushed over to the nearest nurse and asked if I had missed anything. She told me to go in and find out for myself. I went into the room to find The Wife smiling in the bed. “I just got checked and I am 90cm! !” she exclaimed proudly. “90cm!?! ?” I responded, making a circle with my arms as large as I could. In her tired state, The Wife had confused 9cm with 90cm. After confirming that the uterus had not actually become a walk in closet, we started preparing to move into the delivery room. St. Boniface Hospital has fantastic rooms for delivering babies. They are like individual hotel rooms that come equipped with a large shower, exercise balls, adjustable lights, stereo systems, and plenty of soundproofing. Unfortunately, those rooms are only available for uncomplicated full term pregnancies. When we hit the 10cm mark we were moved into an operating room. 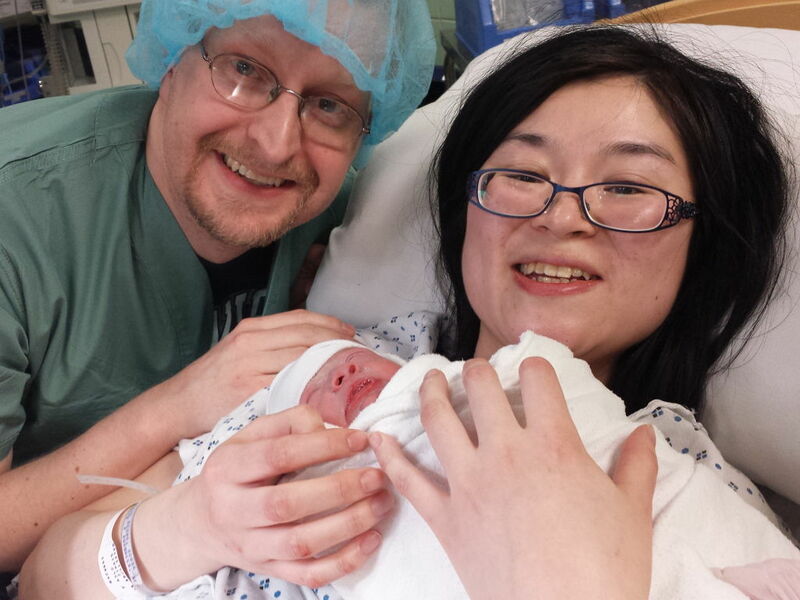 February 14, 2014 3:00pm (37 hours of labour): The operating room was a busy place. The walls were filled with cabinets full of supplies, all labelled like we were in the 1960’s Batcave. Present in the room was a doctor (34 weeks pregnant), two nurses, the doula, me, three neonatal intensive care doctors, and of course The Wife, strapped onto a bed in the center of the room. I decided that if I was going to be in the room for delivery that I would be standing near The Wife’s head and staying away from the “business end” of things. Out of all of the people in the room, I was probably the least useful. The best I could do was to stay out of the way and provide support. By the time that we got everyone assembled in the room, the water had still not broken. Once again I cursed all of the movies and TV shows that showed the water breaking at some hilariously inopportune time. The doctor broke the water and things started happening very quickly. During the entire 37 hours of labour, The Wife had avoided taking any of the available pain medication. Her goal was to see if she could get through the entire delivery drug free. Using some breathing techniques and samurai spirit she was able to survive up to the end. However, by the time she actually wanted the pain meds it was too late and the baby was coming out. Less than 15 minutes from the time the water was broken the pregnant doctor was catching our new son, who announced his presence in the operating room by SCREAMING his little lungs out. He was immediately taken and examined by the three NICU doctors. When he was found to be healthy, one of the doctors brought him over to see The Wife and we took our first family picture. From this point forward, Wooshy was now known as Hanzo, named after the legendary Japanese hero Hattori Hanzo. I proudly followed little Hanzo out of the operating room to his new home in the Neonatal Intensive Care unit, where all premature babies stay for observation. It was a fantastic and exhausting time, and we were both very happy. The Wife likely regrets not taking some paid meds, and said that if she ever had a second child she will get an epidural. I regret that my Winnipeg Jets shirt was not visible under the hospital scrubs that I had to wear in the delivery room. I wanted the mighty Jets logo to be one of the first things that Hanzo saw upon his arrival into the world. GO JETS GO! This entry was posted on March 8, 2014, 8:00 pm and is filed under Uncategorized. You can follow any responses to this entry through RSS 2.0. You can leave a response, or trackback from your own site.